#UNACUHCP2018 member delegates got wound up by some rousing speeches, then waded into the serious business of the union on day two of our 38th biennial convention at the Disneyland Hotel. 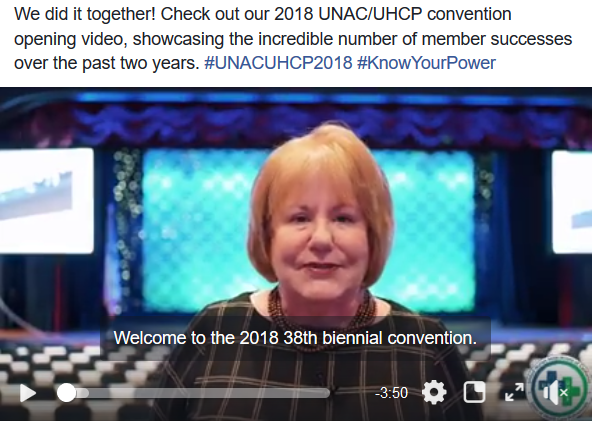 The day kicked off with this powerful video recap of UNAC/UHCP’s action-packed last two years of historic rallies, contract victories and selfless community service. Lee Saunders, AFSCME International President, recognized our leadership within the worlds of both labor and health care, and the example we’ve set as an energized, engaged and empowered union. In the afternoon, delegates adopted resolutions, including to fight continue community service; fight so-called right-to-work laws; engage and empower new members 30, 60 and 90 days after hire; and more; then debated and voted on proposed constitutional amendments. California’s Attorney General Xavier Becerra addressed the convention in the afternoon, honoring RNs and health care professionals as the most trusted voices in American life. “People know what you do and people respect the way you do it,” said Becerra. The day finished with candidate speeches for UNAC/UHCP State Secretary and open board of directors seats. First round voting will take place tomorrow, with results announced at the end of the day, or runoff voting held on Wednesday if needed.